I could start labor any time between now and 2-4 weeks from now. But you can plan out your perfect nursery! Over the last 5 months, I've been planning and pinning my ideal nursery. I wanted a tree as the focal point that covers two walls, but I also fell in love with a turtle theme so I combined them both. At first, I thought of ordering a decal and putting it on the wall. But I work in advertising which means I have tons of creative and talented friends. None more talented then my amazing illustrator friend Meg. When she first found out I was pregnant, she said "Let's do a mural!" So we did. Meg did 90% of this artwork and Dave finished the rest. Yes, my husband, the left brained scientific PhD man I married who can pretty much figure out how to put anything together can also DRAW and PAINT. Who knew? He drew the frog and the top turtle. So without dragging this out any longer, here's a little video I put together quickly that shows you our finished nursery. Hope you enjoy! In blog land it's become "THE" marathon. Among fast runners, it's the "ULTIMATE" race. But to me, I'd rather watch then run. Don't I look happy? I wasn't. I was pretty miserable! Truth, I thought last year was too hot for a marathon (I think it topped off at 65 degrees...) This year it was hotter than that at 7am. Not fun for runners. I've lived right off the course practically my entire life. I've missed watching the race only once in my almost thirty years. I love being there to support the runners and taking everything in. BUT I don't love this marathon. Personally, I think NY is the best marathon in the world. Read this post for my defense! People always talk about Boston being the IT marathon. 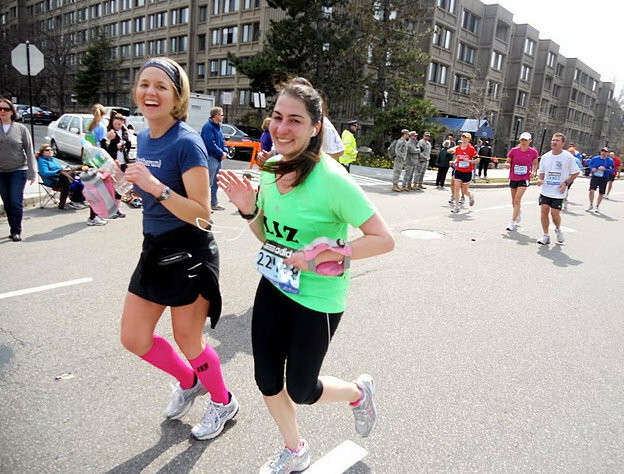 Did it pave the way for women runners? Absolutely. Is the energy in Boston electrifying? Oh yes. But first, you have to get into Boston. You see, the marathon is run 90% in the suburbs west of the city of Boston. You run through Hopkinton, Ashland, Framingham, Natick, Wellesley, Newton, Chestnut Hill, Brighton, Brookline and eventually Boston. You run on streets I've been running on my whole life. 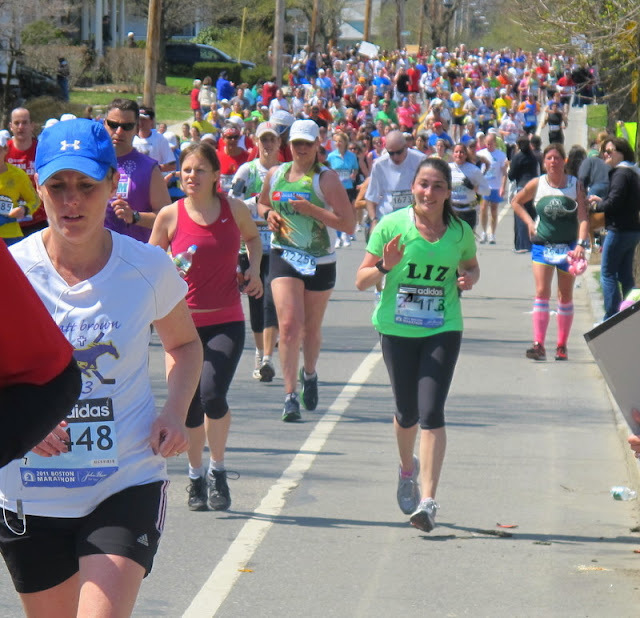 Sometimes I think they should rename the race to the Metrowest Marathon because as BIG as Boston has become- most people in other parts of Massachusetts NEVER watch. Yep, you heard me right. If you didn't grow up west of Boston, you most likely didn't grow up watching the Boston Marathon. The one year I missed the marathon was the year I worked at a company on the North Shore. Luckily now I work in the city and Patriots Day/Marathon Monday is one of our celebrated days off. And I couldn't he happier about it. Because I love watching this race! When I found out it was going to be 87 degrees today, I decided to stay close to home around the mile 4 mark. Then I saw Lindsay looking really strong and hydrating, almost missed a photo! And after that I saw Skinny Runner! Who just ran Gansett two days ago. I don't know how she does it! When Wave 2 started, I began the search for Corey. Luckily we both spotted each other!!! And now I'm sitting on the couch watching the rest of the marathon on TV. 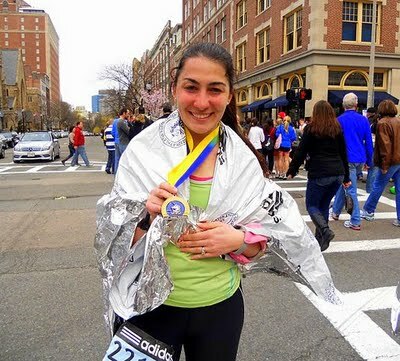 Congrats to all 2012 Boston Marathon runners!!! You guys are all so amazing and inspiring!! !